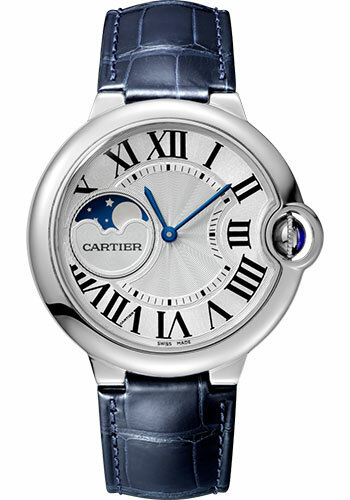 37mm stainless steel case, 13mm thick, sapphire crystal, silvered flinqué dial with blued-steel sword-shaped hands, automatic movement with moon phases display, blue alligator strap, stainless steel double adjustable folding buckle. Water resistant to 30 meteres. 37mm stainless steel case, 13mm thick, sapphire crystal, silvered flinqué dial with blued-steel sword-shaped hands, automatic movement with moon phases display, stainless steel bracelet. Water resistant to 30 meteres.